A country’s birthchart contains valuable astrological information of national and international importance. It reveals — to its citizens — the country’s destiny and — to the citizens of the world — its role on the international stage. Assessing the chart and the events and conditions the country is destined to experience, at a particular moment in time, is the astrologer’s job: And the world’s best astrologer working with an erroneous birth time and faulty chart is destined to get it wrong. The USA falls into this ‘long ago’ category. The date of birth — July 4, 1776 — and the place of birth — Philadelphia Pa (39N57; 75W09) — are known: But because of her dominant role as a social, cultural and economic leader her birthchart contains valuable information — for all the citizens of the world — and every effort should be made to ascertain her precise time of birth: And over the past 100 years that’s what astrologers have tried to do. In her book Accurate World Horoscopes (published 1984) Doris Chase Doane points out: ‘In various astrological sources there are some eight different charts for the United States of America. (And) I daresay that there may be many arguments as to the correct chart, but the exact time has not been recorded Therefore all the published charts have been rectified’ And chart rectification is a high risk, very uncertain enterprise. It’s a tedious process involving the matching of events with their astrological markers and because the chart is constructed before the birth time is found the normal process — that starts with a birth time — is reversed: And the process is fraught with uncertainty. It requires high-level astrological expertise and great objectivity, but more often than not the historical and other evidence is viewed subjectively. Astrologers have a personal world-view that gives their astrological interpretation of people and events a subjective bias. 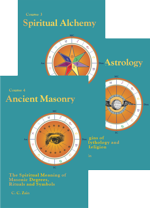 And in mundane astrology the astrologer’s conditioning determines how s/he views, and interprets, a particular event or national characteristic and this compromises the reliability of the rectification process. Of course you can never be 100% certain of a rectified chart’s accuracy and it’s always given a Dirty Data rating: And the person who originally sourced the chart and did the rectification should always acknowledge that s/he was the one who did it. When was the United States born? The first horoscope for the United States was published in 1785 by Ebenezer Sibly, a British astrologer. This was nine years after the birth event. The chart was crudely calculated and constructed and, of course, only contained seven planets. It was timed for 4.50pm and had 8 Sagittarius 11 on the ascendant. No one knows where the birth time came from: And there’s no doubt that this chart was the original source of the 5.00pm time proposed by CE James — as mentioned by CC Zain in his 1935 edition of Mundane Astrology. Another chart with a long history — and many notable supporters, including Llewellyn George — is the Libra rising chart with 14 Libra 42 on the ascendant: And the most recent of these older charts — the Gemini rising chart — is 100 years old. The astrological community is unregulated and divided, but over the past 70 years there have been three concerted attempts to gather and publicly debate the various USA birthcharts. The most recent occurred in the 1990s when Lois Rodden, via Astro-Databank, electronically gathered and displayed the various US charts currently on offer. It was not a complete list, but the circumstantial or documented evidence supporting each of the charts was presented. Rodden’s 1990s listing included a chart timed for 11.00am on July 6, 1775 that’s identified as an ‘independence gained through a declaration of war chart’ and a chart timed for 12.04pm on July 2, 1776, but all the other charts were for July 4, 1776. There was a Virgo rising chart, timed for 9.36am, by Zip Dobbyns, a Scorpio rising chart by Marc Penfield, a Sagittarius rising chart timed for 5.10pm that was just a slight time variation on the first USA chart published in 1785 and a Gemini rising chart that was used by celebrity astrologer Evangeline Adams. This Gemini rising chart was timed for 2.13.32am LMT and had 7 Gemini 23 on the ascendant. See Astro-Databank Nation: USA No: 9. Other charts not on the list include the first Sagittarius rising chart timed for 4.50pm, a Libra rising chart timed for 12.20pm, two other Scorpio rising charts — one by Gaillard Hunt timed for 2.00pm and one by Mildred Schuler timed for 2.40pm — and six other Gemini rising charts. The source notes on the Gemini rising chart — see Nation: USA No. 9 on Astro-Databank — state: American Astrology in its January 1995 edition wrote: ‘The earliest reference we could find to the Gemini rising chart (2.17am LMT) was that the chart was rectified by HV Herndon.’ And Jayj Jacobs explains that Evangeline Adams used a chart timed for 2.13.32am LMT with 7 Gemini 23 ascending. That Dodson, in Horoscopes of US Cities and States, used the same time, but his chart has 7 Gemini 14 on the ascendant. 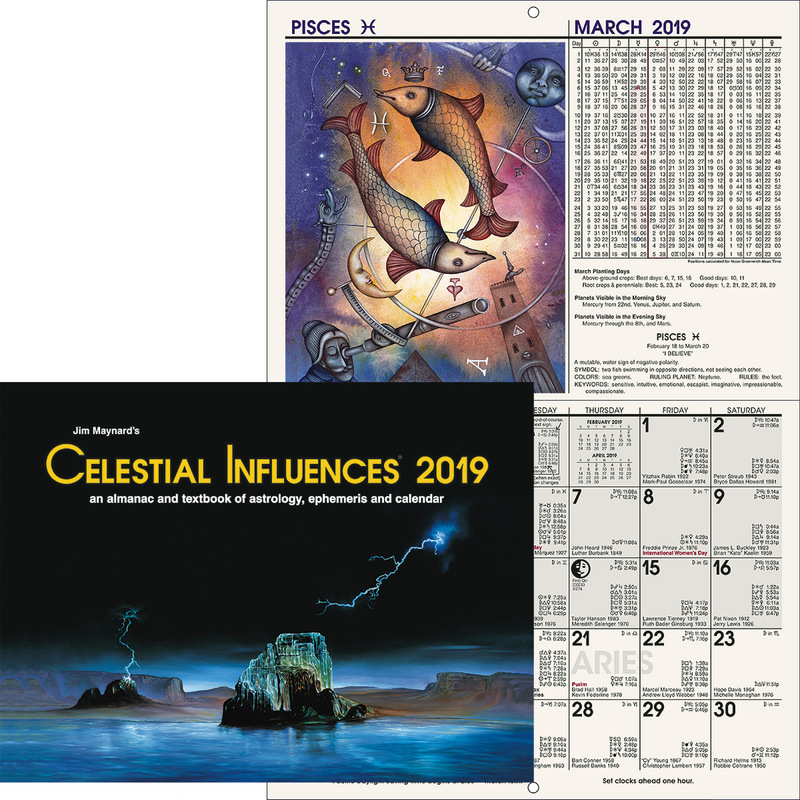 That Jim Lewis in his Mundane Maps uses a chart with 7 Gemini 30 on the ascendant: And that, since 1971, my dad, Don Jacobs, has used a chart with 7 Gemini 35 on the ascendant and that he (Jayj) and his father had accurately predicted the entire (1972) Watergate scenario using this chart. Back in 1949 the American Federation of Astrologers asked the question: ‘When was the United States born?’ And the country’s foremost astrologers answered the question by submitting their preferred charts and birth times. In AFA Research Bulletin No 3, Ralph Kraum and Ernest A. Grant presented the seven top contenders. There was the original Sagittarius rising chart, the Libra rising chart timed for 12.20pm, the Scorpio rising chart timed for 2.00pm and a July 2, 1776 chart timed for 7.00pm. Three of the charts had Gemini rising. One proposed by Clement Hay with 20 Gemini 11 on the ascendant was timed for 3.01.17am LMT. Another proposed by Walter M. Wynne had 8 Gemini 06 ascending. It was timed for 2.16am LMT and the other with 8 Gemini 47 on the ascendant was timed for 2.17am. The 2.17am chart is not sourced, but the authors of the research bulletin state: ‘This is probably the most recently advocated horoscope for the United States, which was carefully tested by some American astrologers at the outset of World War 11. On the basis of this chart some very remarkable predictions have been made, timing them to the day.’ This 2.17am chart was the one used by Elbert Benjamine except it didn’t have 8 Gemini 47 on the ascendant — it had 7 Gemini 35. There are lots of US charts with Gemini rising, but each one’s a ‘personal’ variation of an original chart. This investigation concerns the original — who did it? So here’s the lowdown on the source of the USA birthchart with 7 Gemini 35 ascending. ‘In the year 1908 desiring to have as correct a chart of the U.S. as possible, in order to make some predictions which have since come to pass, I worked with all the more important historical events affecting the country and the result of my researches gave about 7 degrees of Gemini on the Ascendant. Without being aware of these findings of mine HV Herndon published in the September 1924 issue of Practical Astrology Magazine a chart he had worked out from the commencement of the ‘Around the World Airplane Flight’, and which he had checked somewhat in other ways. This chart, which will be found on the frontispiece, also has 7 degrees of Gemini rising; and while it is probably premature to state positively that 7 degrees Gemini is on the Ascendant of the United States, I am convinced that this is at least the approximate degree. It is said that when independence was declared Congress sat up all the night of July 3-4, debating and that agreement was reached at a very early hour in the morning. The chart as given is for 2:17am Philadelphia, Pa. These comments did not appear in the 1935 edition of Mundane Astrology and the same chart that’s presented there is not sourced. CC Zain then provides astrological evidence to validate the chart: ‘The following are the aspects of the planets by transit to the places of the planets in the chart of the U.S. when important events occurred’ And you need to know that he employed transit aspects to natal planets to explain major events — not major progressions — and the chart he presented was not quite right. A computer calculated chart for 2.17am has 8 Gemini 21 on the ascendant — not 7 Gemini 35 or (8 Gemini 47). It is possible that the original chart published by HV Herndon was copied and accepted by CC Zain without a calculation check and you need to know that while the chart’s birthtime kept changing — from 2.17am to 2.13am to 2.14.43am — the ascending degree always stayed the same. This suggests that the chart’s ascending degree is the key factor. The birthtime that gives 7 Gemini 35 on the ascendant is 2.14.15am. Neptune’s incorrect position is understandable — his precise position in the sky is difficult to calculate, even today — and astrologers can only work with data provided by the ephemeris maker: But it does mean that events involving birthchart Neptune that were validated by transit aspects and later by major progressed aspects don’t add up. The astrology looks good, but it was all an illusion. This revelation seems to contradict the earlier (1928) reference to HV Herndon as the person who sourced the rectified chart. So what’s going on? It is definitely known that Elbert Benjamine in 1908 was convinced that 7 degrees of Gemini was the approximate degree on the ascendant of the United States chart: and that in the 1928 edition of Mundane Astrology he presented a chart published by HV Herndon in 1924. The pictured chart had 7 Gemini 35 on the ascendant, but it’s important to note that he doesn’t claim to have used the chart. The chart is timed for 2.17am, but this time doesn’t give 7 Gemini 35 rising (or 8 Gemini 47). It gives 8 Gemini 21. So what we have is a right chart with a wrong time. The same unsourced, but more precisely calculated chart with 7 Taurus 35 — should be 7 Gemini 35 — on the ascendant was published in the 1935 edition of Mundane Astrology. It was timed for 2.14.43am — and 2.13am — and while the time kept changing the ascendant stayed the same. 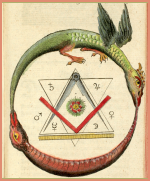 Then in 1940 Elbert Benjamine categorically states in American Astrology magazine that the chart he had used since 1908 — referring to a chart that had 7 Gemini 35 on the ascendant — had been given to him by Dr. James D Keifer. We don’t have an original copy of this chart — or the Herndon chart — so we don’t really know if either chart actually had 7 Gemini 35 ascending. The chart provided by Elbert Benjamine does and it’s possible that he and the Brotherhood of Light’s mundane astrology class, who were actively engaged in ongoing research into the chart, fine-tuned the approximate degree to a more precise 7 Gemini 35. But the documented evidence from Elbert Benjamine states that he was given the 7 Gemini 35 chart by Dr. James D Keifer in 1908 — so he did it. His Gemini rising chart precedes the Herndon chart by 16 years and astrologers using the US chart with 7 Gemini 35 ascending should identify Dr. James D Keifer as its source — data supplied by an acquaintance who was a descendant of a signer of the Declaration of Independence. And it seems that Dr. Keifer did a lot of research into the chart before he gave it to Elbert Benjamine. In Course 13 – Mundane Astrology — CC Zain presents a chart for Los Angeles. He gives no source reference, but in the original 1928 edition he wrote: ‘Now in regard to the chart for Los Angeles, some years ago Dr. JD Keifer conducted an intensive research into the records of the founding of the pueblo of Los Angeles. His researches give the date Sept 4, 1781 at 9.00am. The chart here used (refer to frontispiece) is the one he published in a book which has since gone out of print.’ And maybe this book contains the original USA Gemini rising chart that he gave to Elbert Benjamine. 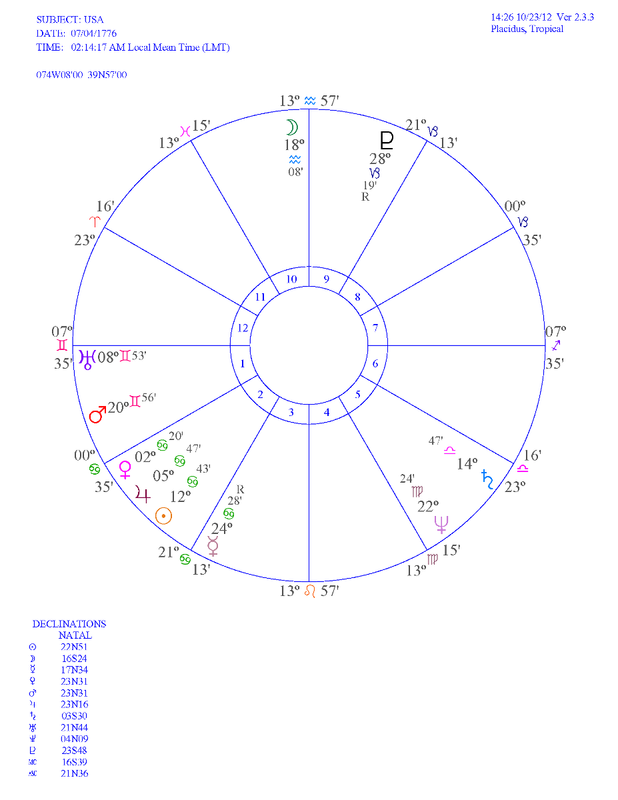 The original Los Angeles chart, timed for 9.00am, had 24 Libra 24 on the ascendant. But in the 1935 edition of Mundane Astrology there was an updated chart with a new birth time — 9.17am — and a new ascendant — 27 Libra 27. This, no doubt, was the result of on-going research, but there’s a problem. 9.17am doesn’t give 27 Libra 27 on the ascendant. The Los Angeles chart presented in Course 13 – Mundane Astrology — requires a birth time of 9.14.15am. Every now and then a new USA birthchart turns up and Astro-Databank is currently listing 14 charts. Nation: Chart No. 9 is identified as ‘7 Gemini rising’ but there’s no mention of Dr James D Keifer in the source notes. And who was HV Herndon? Howard V Herndon was a San Francisco based astrologer and publisher. He’s mentioned in Brotherhood of Light Course 21, The Next Life, as the source of the birth data of Yehudi Menuhin — ‘Data obtained from parents by HV Herndon’ — but the data he got was wrong. His rectified USA chart — timed for 2.17am LMT — was first published in the September 1924 edition of his astrological magazine, Practical Astrology. Its ascending degree is unknown. And what about that early am birth time? Well, there is supportive evidence. In the book The United States, published 1947, by RA Billington, BJ Loewenborg and SH Bruckunier the authors state on page 15; ‘The symbolic first breath, or birth hour, of the nation occurred in the early hours of July 4, 1776. The writer has figured this to be just about 3,00am however no documentary evidence exists to verify this early morning birth hour (or any other hour) so long a part of the tradition of the national chart.’ Elbert Benjamine had sited similar circumstantial evidence in 1928. The original 7 Gemini 35 rising chart that was used by Elbert Benjamine had Neptune located at 24 Virgo 07 and Pluto at 27 Capricorn 54. New updated planetary theories for both planets (which are probably not 100% correct) place Neptune at 22 Virgo 24 and Pluto at 28 Capricorn 19 although different chart calculation programs do give slightly different positions. Neptune’s position in the original chart is not a misprint. It’s also located at 24 Virgo 07 in the chart presented in Astrology – Thirty Years Research published in 1956: But it’s slightly incorrect position did result in some erroneous mismatching of major events with their astrological markers. September 19, 1929 — First great crash in the stock market; progressed Venus in 8th (other people’s money), ruler of 2nd (people’s money) opposition (separation) birthchart Sun in 2nd (money); progressed Mars conjunct birthchart Neptune in 5th (stock market); progressed Jupiter ruler of 2nd (money) conjunct birthchart Mercury and sextile birthchart Neptune in 5th (speculation). But because Neptune’s position was incorrect progressed Mars was not conjunction birthchart Neptune on October 24, 1929. 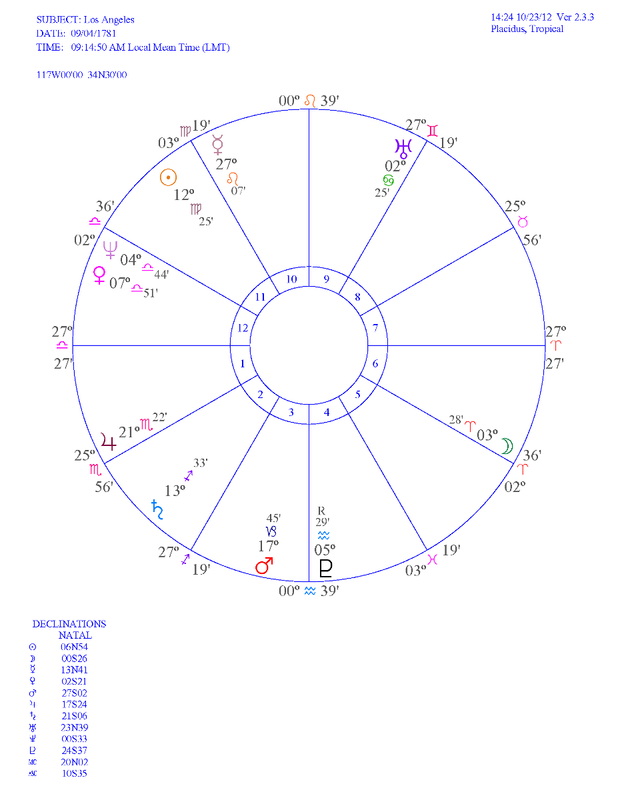 The computer-calculated chart has birthchart Neptune at 22 Virgo 25, progressed Neptune at 26 Virgo 56 and progressed Mars at 24 Virgo 25 so there’s no Mars-Neptune conjunction. The unmentioned aspect that mapped the stock market crash was progressed MC (at 14 Cancer 20) in the second house (money and banks) square birthchart Saturn in the fifth house (speculation). The financial frenzy that occurred prior to the crash was due to progressed Mars conjunction birthchart Neptune between November 1923 and October 1927 and progressed Mars parallel birthchart Neptune perfect in March 1929. A country’s birth time is a particularly contentious issue. So in 1938 when Elbert Benjamine was asked to provide Student Astrologer magazine with some commentary on the USA birthchart he was using — the one with 7 Gemini 35 on the ascendant — he wrote: ‘I have been requested to furnish for its mundane department the birthchart and progressed positions for the United States. I have no desire to enter into a controversy as to the time of day the United States definitely came into existence as an independent entity; but neither do I have any reluctance in publishing the chart I have used since 1908, which is also the chart of the US used by the Brotherhood of Light class in Mundane Astrology, which has met in Los Angeles each week for over 23 years. Not only has the class checked the progressed aspects in this chart against the important events in the history of the U.S. but they have found it completely satisfactory as a chart with which to predict, from the progressed aspects, important events before they have transpired.’ And that, in the end, is the test of any chart.